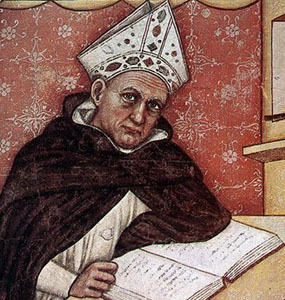 Albert, (1206 – 1280), a Dominican and Priest who taught theology at Cologne and Paris. He was also a teacher of St Thomas Aquinas. He is most known for his interest in the natural sciences. He wrote and illustrated guides and was considered an authority on these things. He was a theological writer and a Doctor of the Church and described as “a teacher of all that there is to know”.